Aiming to increase its presence in the Indian tablet market, South Korean consumer electronics major Samsung today launched a tablet with 8-inch TFT screen, Galaxy Note 510, in India. The 3G-enabled tablet is powered by Android 4.1 (Jelly Bean) OS and runs on 1.6GHz quad-core processor with 2GB RAM, Samsung Electronics said in a release. Galaxy Note 510, priced at Rs 30,900, has 16GB internal memory that can be expanded up to 64 GB through a microSD card, it added. Connectovoty features in the new tablet are 2G, 3G, Wi-Fi, Bluetooth 4.0, microUSB 2.0 and infrared; it can be used to make phone calls and send text messages over GSM network. A 5MP autofocus camera is placed on the back of this tablet, whereas a 1.3MP unit is used on the front panel. According to the company, the 4,600mAh battery of this tablet offers talk time of nine hours. This tablet takes on the likes of Apple iPad mini and Google Nexus 7 in the Indian market. 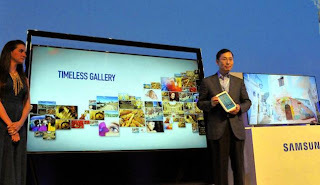 "Galaxy Note 510 breathes fresh life into the category as it delivers the perfect fusion of portability and everyday productivity resulting in a pioneering, pocket-sized solution that enhances and enriches our everyday lives," Samsung Electronics president and CEO (South West Asia) BD Park said. This new tablet offers innovative solutions like the 'multi-window', which splits the portable screen and allows optimal access to a number of live applications, the release said. Samsung has also launched an offer with the tablet, in which it assures the owner who sends an SMS to the firm gets 12,000 coins in the virtual wallet. These coins get activated as soon as one downloads the myServices application and can be redeemed by streaming premium movie, downloading bollywood songs, playing game and come with a validity period of 3 months from the date of purchase.